Home / Topics / History / The Iranian Question: Nuclear Power or Nuclear Warheads? Watching what’s happening from the Middle East to the Midwest over the past few weeks, it seems that everyone has an opinion about Iran today, including the Iranian government. Iran has held a fascination over people from ancient history—including empires such as that of Cyrus the Great—to the modern era, with the rise of the Islamic Republic under Ayatollah Ruhollah Khomeini. Today, that focus is on Iran’s nuclear program. Tehran insists that the program is for peaceful purposes, but the regime’s opponents, including the Israeli government, argue that the program has a more sinister objective—nuclear weapons. What’s so fascinating about this debate is that despite how long Iran’s nuclear program has been around, the debate on ending it makes it seem as though it is a recent phenomenon. Iran’s nuclear program was actually started by the United States in the 1950s. A 2007 Chicago Tribune article detailed the “Atoms for Peace” program, the U.S.’s plan to give satellite countries nuclear reactors. It was a move in a nuclear chess game between the Soviet Union; they sent reactors to North Korea, Libya and Bulgaria, while the U.S. sent reactors to Pakistan, Iran and Columbia. In fact, type “Iran’s nuclear program” into Wikipedia and you will see a photo of the Shah in an American pro-nuclear power advertisement. 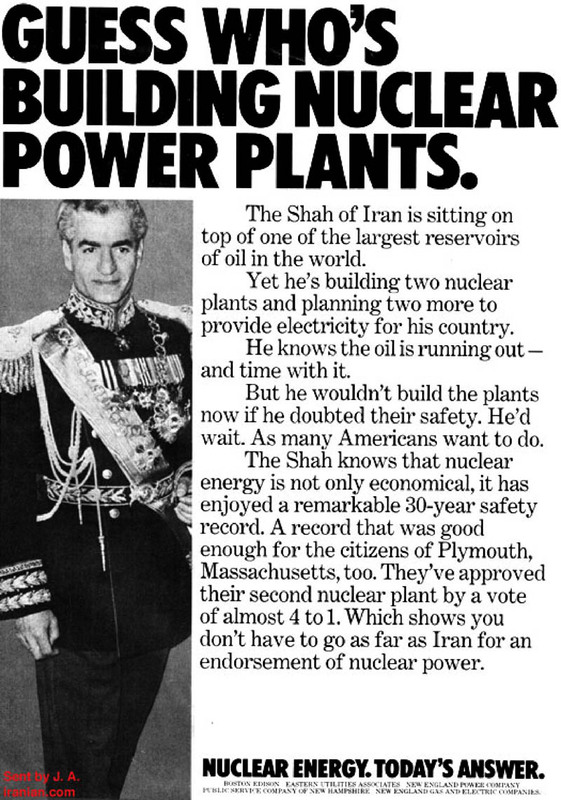 “The Shah knows that nuclear energy is not only economical, it has enjoyed a remarkable 30-year safety record. A record that was good enough for the citizens of Plymouth, Massachusetts, too. They’ve approved their second nuclear power plant by a vote of almost 4 to 1. Which shows you don’t have to go as far as Iran for an endorsement of nuclear power,” the advertisement said. Granted, the Shah was considered an American as well as an Israeli ally, but still it should give pause to anyone in either country who disapproves of any nuclear program in Iran. The fact is: The United States of America and their allies, with tacit Israeli approval, built Iran’s original nuclear reactors. Meanwhile, both the United States and Israel are themselves nuclear powers—the U.S. has perhaps the largest stockpile in the world, while the exact number of Israeli warheads is unknown. What fuels the recent anger towards Iran is a combination of several issues. The short version is: Iran wants to enrich its uranium, while countries like the United States oppose it, because they are concerned that uranium enrichment will lead to nuclear weapons. There’s also a fear of what the nuclear weapons will be used for, if Iran ever gets them. Will the weapons be used as leverage in geopolitics? Will it encourage other neighboring countries to openly pursue entry into the nuclear club? Or given the incendiary statements of Iran’s current president, Mahmoud Ahmadinejad, regarding the Holocaust, Israel and the United States, will the weapons be used for a more sinister purpose, detonating over Tel Aviv or some other U.S.-friendly location? This November, an International Atomic Energy Agency (IAEA) report claims that there was reliable evidence that Iran was carrying out experiments aimed at making a nuclear weapon. Iran has weathered both substantial criticism as well as new sanctions by the U.S., UK, and EU. Many of these sanctions are directed towards the Central Bank of Iran, which will likely cause a much more crippling blow to the Iranian economy than previous rounds of sanctions. In response to UK’s round of sanctions, student protesters stormed the UK’s embassy in Tehran. Conjuring up images of the 1979 Iranian hostage crisis, when Iranian students held hostages in the American Embassy for 444 days, the UK pulled its diplomatic staff out of Iran and closed the Iranian embassy in London. Several EU countries, including France, Germany, and the Netherlands pulled their envoys from Tehran as well. So the question is, what is the proper response to Iran’s nuclear program? One response that should not be actively pursued is military action. It’s premature and those who advocate for it at this moment are dangerously overlooking the consequences of such action. If anything, it could be worse than Iraq or Afghanistan. Great post Leigh. It is true that nuclear can provide lots of power (our own sun is a giant nuclear power plant), and it is relatively new technology to humans, so there is still safety concerns. In Japan that land will be radioactive for years where the nuclear power plants got damaged and leaked. If something similar were to happen in Tehran from an earthquake the area and countries around them could have the same issues Japan had but in slightly different treat. I hope this all settles out peacefully.